Shadowrun Missions is a dynamic sixth world campaign that uses the Shadowrun 5thEdition role playing game. It allows players to create characters and play in sanctioned events around the world just as they would in a normal home campaign. It also allows gamemasters to welcome players from all over the world into their campaign. Because of the framework in which the campaign is commonly run (particularly conventions), there are some slight differences in how certain aspects of the game are handled and what is allowed. Keep in mind that game balance and good storytelling and roleplaying will take precedence over game mechanics. The Chicago story arc follows up the status quo as laid out in Feral Cities and the electoral results set up in Dirty Tricks. Illinois Governor Anthony Presbitiro won his re-election bid on the campaign of rebuilding Chicago, and he helped newcomer Allan Brown get elected as the new mayor of Chicago on the same platform. The two have initiated an aggressive campaign called Project: Takeback (“Healing Chicago and making it safer you and your family!”) to repair and rebuild the shattered city. The first part of this is revoking the Adverse Possession ruling of the Chicago Supreme Court (p. 32, Feral Cities) which granted property ownership to anyone who lived on a piece of land continuously for an extended period of time without the rightful owner stepping forward to claim it. As of June 1, 2075, Adverse Possession was thrown out, and the residents of the former Containment Zone and areas of the Corridor no longer have any legal rights to property they may have been living on for as long as twenty years. Needless to say, this angered many of those living in these areas of the city. The second part is offering up a one-year “reclamation period”where anyone who can prove they had a legal claim to a piece of land prior to the Containment Zone going up or have since purchased rights to that property will be given ownership immediately. After one year, any remaining property will be auctioned off to any interested parties for immediate ownership. However, there are two catches to this. The first is that any entities normally exempt from local land taxes due to extraterritoriality will have to pay taxes for the first five years to pay for rebuilding critical infrastructures in the area. The second is that all parties taking ownership of land have until June 1, 2077 to physically take possession, clear the land, rebuild, and start using it, or else the city will declare eminent domain and seize the property back for resale. Many corporations, both new and old, are moving in to take advantage of Project: Takeback, and you can bet the residents of the Zone aren’t going to take this lying down. Everyone’s looking to hire runners, whether it’s to destroy evidence left behind before the CZ went up, reclaim lost data and tech, prove ownership of property, stop someone else from claiming the land, or simply throw a monkey wrench in the entire process. Either way, there’s a lot of money to be made, and it’s a good time to be a runner in Chicago! Just keep in mind that Chicago was termed a Feral City for a reason. Ghouls, bugs, magical voids, toxic zones, gangs, organized crime, and the government combine to make the Windy City a mess. In fact, the sprawl made Aethernet’s Five Most Dangerous Cities list the last ten years running for a damned good reason. Watch your back. Shoot straight. Conserve ammo. And never, ever deal with a dragon. The Players Anyone can play! 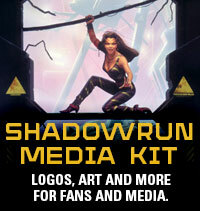 We have players from around the world – all you need is a desire to play Shadowrun. An Internet connection also helps to keep up to date with the latest information, and notification of upcoming events. Our games are geared for a more mature audience – this is Shadowrun. 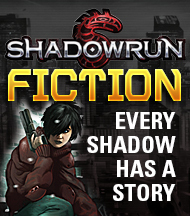 If you are not familiar with the world of Shadowrun, please take a look at the sourcebooks and novels for an idea of the campaign, or read some of the short fiction pieces in the Background section. More information on participating in the campaign is available on the Players page and in the FAQ. 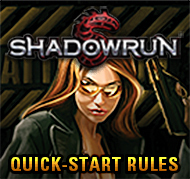 The Characters The characters in Shadowrun Missions are shadowrunners. They are professionals that have come from the streets, escaped their corporate enclaves, left the military, or another background. Everyone has a different story and a different reason for running the shadows, but everyone has a similar goal – try to survive and stay in the shadows. For the most part, characters will have some sort of moral code and be a team player. A character that does not have something to contribute to the team, and goes around killing cops, is not suitable for Shadowrun Missions. Information on creating characters is on the Players page, with common character creation questions addressed in the FAQ. The Events Shadowrun Missions scenarios are commonly held at gaming conventions or other venues where gaming occurs, such as in-store demos. The scenarios can also be played at home for those that have enough people to play and a dedicated gamemaster. Links to current and past adventures can be found on the Missions Downloads pages. When new adventures are released, they can be purchased through the CGL BattleShop or DriveThruRPG. However, active members of the Catalyst Demo Team also get access to the adventures, plus get other benefits in exchange for running events at conventions and public venues! Play Time Scenarios can be offered at any time, and scheduling will remain the purview of the local event organizer. Most event coordinators will allocate a four hour time slot for the game. These scenarios are designed to fit into this schedule. Should you have the luxury to enjoy a longer game, then you will be able to roleplay your character to its fullest potential, conduct more in-depth analysis of a game situation, or just have fun at a relaxed pace. No two groups are expected to play a scenario exactly the same. Full information for GMs and Event Coordinators are on their respective pages. Welcome to Shadowrun Missions!